Good issue on hexagonal flat loops. Battalion so decimated at Gallipoli that it was disbanded in June 1915 before a cap badge could be designed for it. School of Gunnery at Shoeburyness, then Larkhill. redesignated School of Artillery 1920. T / RE / LONDON pair of brass shoulder titles circa 1908-20. A good matching pair each on three loops and complete with backing plates. A very good example on three loops. A good example on flat hexagonal loops. Touch of vedigris to reverse. School of Musketry formed in 1854 redesignated Small Arms School, Hythe in 1919.; amalgamated with Machine Gun School in 1926 as Small Arms & Machine Gun School; redesignated Small Arms School Corps later that year. A fine scarce example on three loops. A good example on three loops and complete with backing plate. First Surrey Rifles Battalion, London Regiment, HQ 4, Flodden Road, Camberwell; landed in France 16th March, 1915. T / 5 / KOSB Brass King's Own Scottish Borderers Shoulder Title.circa 1908-21. CGA pair of Ceylon Garrison Artillery post 1918 shoulder titles. Ceylon Garrison Artillery was formed in 1918 by the amalgamation of the Ceylon Artillery Volunteers and the Town Guard Artillery. RUTLISH SCHOOL / C / E.SURREY rare brass shoulder title. A fine example on loops of this rare pattern. Named after William Rutlish, embroiderer to King Charles II. Recognised 121.3.21 and affiliated to 5th Bn. East Surrey Regiment. 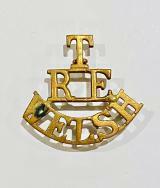 T / RE / WELSH post 1908 Royal Engineers brass shoulder title. A good example onl three loops. A little verdigris. T / BRECKNOCK Brass Welsh Shouther Title. A good example on three flat hexagonal loops.